Those flowers sure make it come alive! Number two is my favorite! ​I like both but for me it would depend on how I want to machine quilt it. I might want the plain blocks to put some fancy quilting in. To me there is no question, the second one, but is your person a very plain dresser, an unfussy person? Perhaps they will like the simple one better. i like #2 also..livens up and makes it playful...the quilting of it will add yet another dimension..you will probably love it when finished! Bigger, cuter, sweeter. Trust yourself with this one. I prefer no flowers, but with some interesting quilting in the blocks. Have you asked the person the quilt is for? If they are not a frilly person they might not appreciate the flowers. The person who this is going to is in a nursing home and has mild to moderate dementia. I want her to have a nice quilt from me but realize that things go “missing” in nursing homes. I sure do like those flowers. It really makes the quilt pop. However, I agree with others on what the recipient would like. If she is a child, definitely flowers. edit: The flowers will certainly brighten up the nursing home. 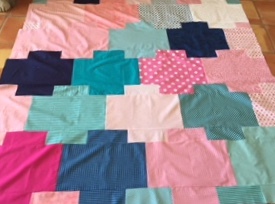 The quilting will perk up the first one and look very nice in her room. Either one will be totally appreciated. It will be such a beautiful gift!! Last edited by D.Henson; 05-06-2018 at 08:36 AM. 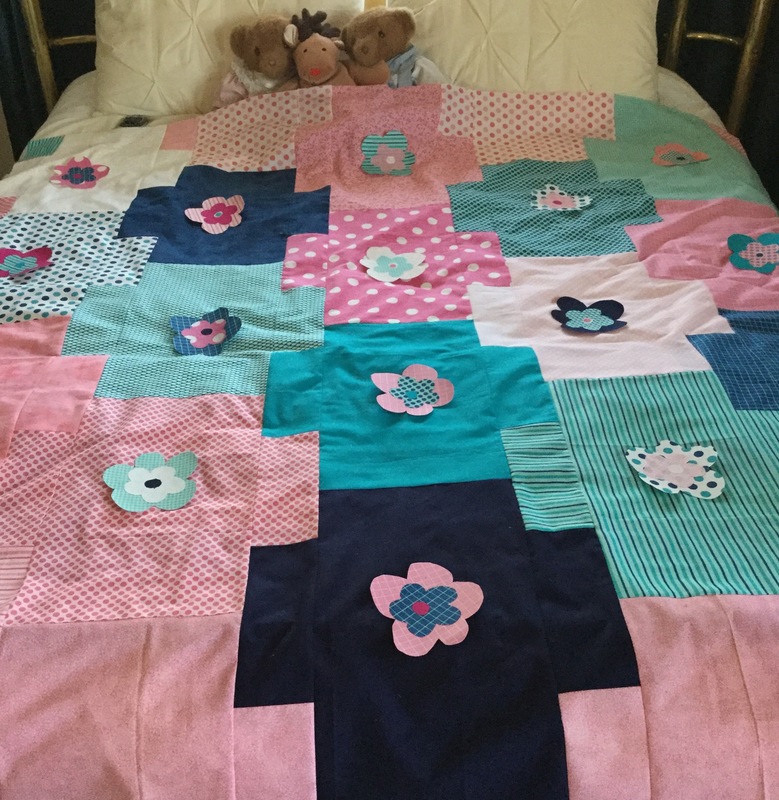 Beautiful quilt even if it's not your cup of tea! The flowers reall doll it up! Another vote for #2. I might even make the flowers a bit bigger by adding a third layer of petals. Not a guarantee but incorporate her name/initials in the quilting and have the label sewn on before quilting so that it too is quilted down. Also make sure that you have a picture of it to show around if it goes on the missing list. Love the flowers - they will add a layer of tactile interest for your aunt as well as being visually appealing. I agree with Sheltie'sMama's suggestions. Actually I would go one step further and applique her name right on the front of the quilt. Perhaps one of the corner blocks? Perhaps there are some other significant things that could go in the other corners as well? Date of birth? Marriage Date? Husband's name? Kids names? Grands? or give visitors things to discuss with her. The flowers definitely make the quilt look more interesting. Plus they make it look like you put more time, care, effort and love into making it. Yes, as you can tell I am voting for the floral version! Good thought .... you may want to make sure that they are well stitched in place, as sadly dementia patients often are "pickers" and could soon have the flowers picked right off! They both look good, but your plushies seem to like #2 better! The flowers really make it jump up and say "pay attention to me". The bears and the moose seem to like it as well. Ditto! I agree with Christine. Definitely #2 love the flowers. Great suggestions! Thank you so much everyone! I agree with the suggestion to add her name ... on the front of the quilt in large script. Nursery homes are notorious for things to disappear. The flowers are a great addition. She's going to love it!